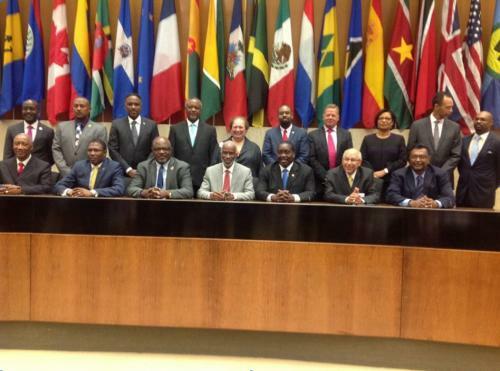 Minister of National Security, Hon Robert Montague this week attended the Sixth Annual Caribbean-United States Security Cooperation Dialogue in Washington DC. The dialogue is part of the Caribbean Basin Security Initiative (CBSI) launched by President Obama in 2009. The Dialogue brought together senior representatives from the Caribbean states, the United States, and international partners to strengthen regional cooperaNAtional Security Minister attends CBSI in Washington DCtion on citizen security and combat the flow of illicit narcotics and other transnational crimes that threaten regional security. The United States has committed nearly $437 million to CBSI since its inception. Recognizing a strong link between security, social development, and economic growth, this year’s dialogue addressed ways to advance Caribbean public safety and security institutions as well as harmonize sources for crime analysis for greater peace and stability in the Caribbean and the hemisphere. At the end of the dialogue, the member states committed to the priorities of substantially reducing illicit trafficking, advancing public safety and security and promoting social justice to improve the lives of citizens. 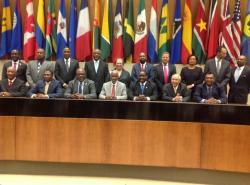 They further underscored the importance of implementing policies to promote security, continuing efforts through regional integration mechanisms, and financing Caribbean national and regional public safety and security institutions; and also underscored the value of international partner support and the need to improve coordination and reduce duplication of efforts. This would be geared towards maximising the effectiveness of that support towards advancing common security objectives in the Caribbean.